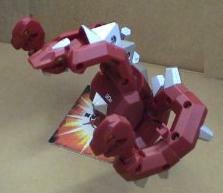 The Destrakon Gear is the battle gear of Rubanoid, Sid Arcale's partner Bakugan in season 3 Gundalian Invaders. It is made up of snakelike parts that can shoot laser beams at any angle. It will be released in November/December. It has so far only been shown in Deka size. Its silver deka version has 90 Gs. The copper version 80 Gs. Purchase your Destrakon Battle Gear from Amazon now!